Protesters are imploring the government to stop the use of the controversial Antiterrorist Law, enacted during the 17-year rule of military dictator General Augusto Pinochet which came to an end in 1990, to prosecute members of indigenous groups such as the Mapuche. In the twenty year period since the fall of the dictatorship, successive Chilean governments have carried on prosecuting people under the law for crimes which supposedly “pose a risk to national security”. Former president Michelle Bachelet denied before the UN Human Rights Council in September 2009 that the anti-terror law had been used abusively against indigenous groups. Those convicted under the law routinely face harsher sentences than other Chileans found guilty of similar offences. 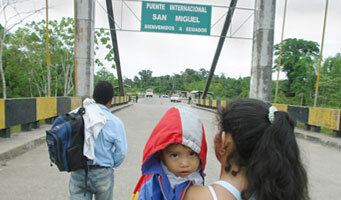 Indigenous groups are also protesting the deployment of government troops on their communities´ land. MaríaTralcal, representing the families of the 32 original hunger strikers, explained that “we have been fighting the Antiterrorist Law for years because there is a catalogue of irregularities that has been carried out against our people which we do not agree with.” Tralcal notes that those charged under the anti-terror law face trials which do not follow regular Chilean legal procedure. She says that the court accepts anonymous witness testimonies, that prisoners are held for up to a year and a half before trial, that police withhold information regarding the investigation until just days before court proceedings begin and that sentences are often two or three times as severe for those who are convicted under the law. “This protest will continue until the end, whatever the consequences,” Tralcal said, “we are not going to interject until the law is fair for everyone and the discrimination against the Mapuche people is stopped”. Several of those on hunger strike are reported to be in deteriorating health, with some having lost up to 18 kilograms in weight since the protest began. The Court of Appeals in the southern city of Concepción has ruled that prisoners can be fed by force, an announcement which drew consternation from protesters, who announced that they would resist any such intervention “by legal means or with physical resistance”. Indigenous groups in the southern and central regions of Chile have battled for control over their ancestral territories since the arrival of Spanish troops in the region hundreds of years ago. 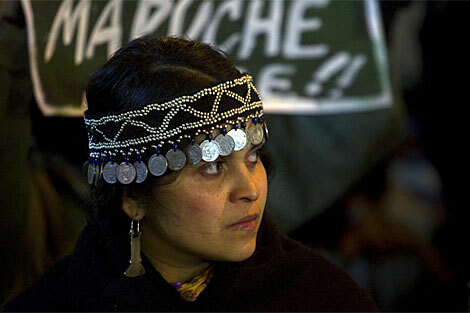 Since Chile gained independence from the Spanish crown, the Mapucheand other regional indigenous groups have faced an ongoing struggle for autonomy and recognition of rights with successive governments, with Pinochet’s rule marked by particularly severe repression. On Thursday, Venezuelan president Hugo Chávez accused the government of U.S. president Barack Obama of funding opposition parties in Venezuela in order to force him out of office with less than a month to go before parliamentary elections. 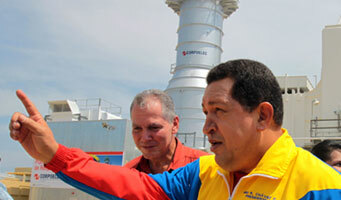 Chávez accused the U.S. of channelling money to opposition groups in Venezuela in order to topple his government. He said that opposition groups “obey the United States government because of all the money they give them, they invest millions of dollars here” before offering a piece of advice to his North American counterpart:“Obama, why don´t you use that money to tackle poverty and the misery that is increasing every day in the United States?” The United States government under George W. Bush gave logistical support to an abortive coup against Chávez in 2002, during which the Venezuelan president was deposed for around 48 hours prior to being reinstated with the assistance of the military. The Bush administration immediately recognised the new president, businessman Pedro Carmona, and it later emerged that conspirators in the ultimately unsuccessful putsch had been invited to the White House, and had received training and advice from high-ranking U.S. officials, including individuals such as Elliot Abrams who had been convicted and disgraced following their involvement in the Iran-Contra scandalof the 1980´s. Officials from the Organization of American States disclosed that the U.S. government was both aware of the impending coup attempt, and that it had been sanctioned at the highest level in Washington. Chávez said that domestic opposition to his Bolivarian revolution was rooted in a desire to take Venezuela back to where it was before his 1998 election, decrying previous governments for “reducing Venezuela to its lowest point”. He said that in the past “our culture was minimised. Our indigenous peoples were unrespected, spat on and massacred.” Past governments, Chávez stated, had also neglected the country’s armed forces to the point that “we hardly had any soldiers; we have been improving our armed forces bit by bit.” The president vowed to continue to “reinforce Venezuela economically, politically, culturally, militarily and technologically”. The president of the country’s national elections council, Vicente Díaz, has accused the president of violating electoral law by using national symbols such as the Venezuelan flag during his campaign, a charge which Chávez dismissed. He also denied accusations from the opposition that fraud had marred previous election victories. “They don’t want to learn, they don’t want to respect” he said, before calling on Venezuelans to “respect the result of the elections” which are scheduled for September 26th. Chávez also rejected claims made in the New York Times earlier in the week which compared Caracas unfavourably with Baghdad in terms of security. The paper noted that there have been 43,972 murders in Venezuela since 2007, with over 90 percent of cases going unsolved. The murder rate in Venezuela, already one of Latin America’s highest, has tripled under Chávez´s leadership, with spiralling inflation, a poorly paid and notoriously corrupt police force and an enormous gulf between rich and poor contributing to insecurity in much of the country. The president said it wasn´t true that Venezuela was among the most dangerous countries in the world, but admitted that “insecurity is a serious problem”. He said it was extremely difficult to resolve the problem, adding of his government that “we don´t go around wiping people out in the street”. A group of lawyers from the non-governmental organisation Collective Corporation of Lawyers Jose AlvearRestrepo(Ccajar) are attempting to bring criminal proceedings against former Colombian president Álvaro Uribe, accusing him of treason for signing a deal, thwarted last month by Colombia´s Constitutional Court, that would see the U.S. military and intelligence agencies given access to seven military bases in the east of the country. “We are bringing these criminal charges because the accord regarding the military bases signed with the U.S. government gravely damages national sovereignty” commented Luis Guillermo Pérez, the group´s representative who made the deposition before the Colombian congress. 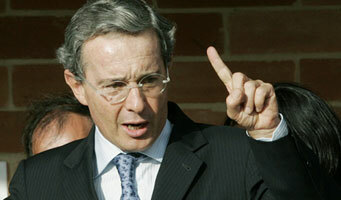 He added that Uribe had violated the country´s constitution by signing the deal on the 31st of October 2009. The then president ignored warnings from government lawyers which informed him of the illegality of numerous subsections of the accord, and informed him that he would need to seek congressional approval before signing the treaty. Uribe ignored this advice, however the plans have been delayed after the Constitutional Court ruled that congressional approval must be sought. Pérez added that Uribe had “committed what the Penal Code of our country calls crimes of treason against the nation, which include harming the country’s reputation and diplomatic treason”. He accused the former president of “compromising Colombia´s national security by permitting the installation of these bases”.Peréz said similar charges would also be brought against at least three other former government ministers. Guatemala: President Álvaro Colom declared a state of emergency on Saturday as torrential rains continued to pour down, with the government saying that much of the repair work undertaken in the aftermath of Hurricane Agatha, which devastated much of the country in early June, has been undone. 18 people have died and many more have been injured since rains began, and some estimates as to the cost of damaged infrastructure in one of the American continent’s poorest countries are as high as US$500 million.Over a hundred people were trapped by a mudslide on Sunday, when rescue teams searching for missing people and others involved in a clean up operation were buried under several tonnes of stone and earth. An estimated 150 people have been reported missing since rains began, with around 3,000 having been evacuated to safety and an additional 20,000 living in areas which have been labelled high-risk zones by authorities. 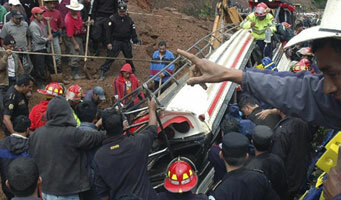 More than 5,000 people have also been evacuated in the nearby Mexican state of Tabasco. 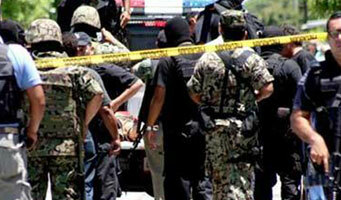 Mexico: The army clashed with an armed gang at a militant training camp 15 kilometres from the town of General Terviñoin the border state of Nuevo León on Thursday, leaving at least 27 people dead. The government did not disclose if there were any Mexican troops among the deceased, who all reportedly died during the battle which began when soldiers were fired on as they approached the camp. The battalion recovered three unidentified hostages, 23 vehicles which had been painted in Mexican army colours and a substantial cache of weapons and ammunition. Mexican president Felipe Calderón acknowledged on Thursday that violence in the country was continuing to worsen, saying it was the result of “an increasingly bloody battle between” armed cartels. The following day, police shot five members of an armed gang dead on a Nuevo León highway near Monerrey after their vehicle refused to stop and a gun battle ensued. Colombia: A UN report has revealed that the number of people displaced by the ongoing conflict between government forces and militant groups waging an insurgency against the state has risen to more than 7,500. The figure represents a 300 percent increase in the number of displaced people since a 2004 ruling of Colombia´s Constitutional Court declared then President Alvaro Uribe´s failure to provide adequate assistance to those affected unconstitutional. Other reports estimate the number of displaced to be much higher. The non-profit Consultancy for Human Rights and Displacement, estimates that around 2.4 million people were displaced within Colombia between 2002 and 2009. In addition, there are an estimated 4 million Colombians in Venezuela and several thousand more in Ecuador who have fled violence across the border. Panama: The government of President Ricardo Martinelli has been accused of not doing enough to address the needs of Panama’s 350,000 indigenous people by a national rights group, which has decried the fact that Panama’s indigenous communities suffer from comparatively high levels of poverty and disease and are restricted by inferior access to education in the Central American country. Teresa Ávila of the Assessor of Public Policy for Panama´s Indigenous Peoples lamented that “the majority of institutions and ministries have no policies directed towards indigenous communities”, adding that when projects are launched, they are top-down government directives which take no account of indigenous peoples’ wishes. Indigenous Panamanians constitute around 10% of the country’s population, with a Health Ministry report released this year alerting that the majority of 5 to 10 year olds from this segment of society suffer from chronic malnutrition while babies are frequently born underweight. Chile: Public sector workers have announced a general strike in protest at layoffs announced by the government of president Sebastian Piñeras. The 48–hour strike will begin next Wednesday, with concern growing among government employees in Chile following the loss of 2,500 jobs so far this year. “We want a formal response from the Executive which addresses the difficulties faced by public sector workers”, said union leader Raúl de la Puente. Peru: Water levels on the Amazon river in the country’s north-east have dropped to their lowest point for 40 years, causing havoc in a region with virtually no road links where riverboats are the principal means of transportation. Peru´s meteorological office attributed the drop, which has prevented access by larger vessels and cut off several towns, to a prolonged period of dry weather. « Previous: CounterSpin: Should we trust the newspaper?